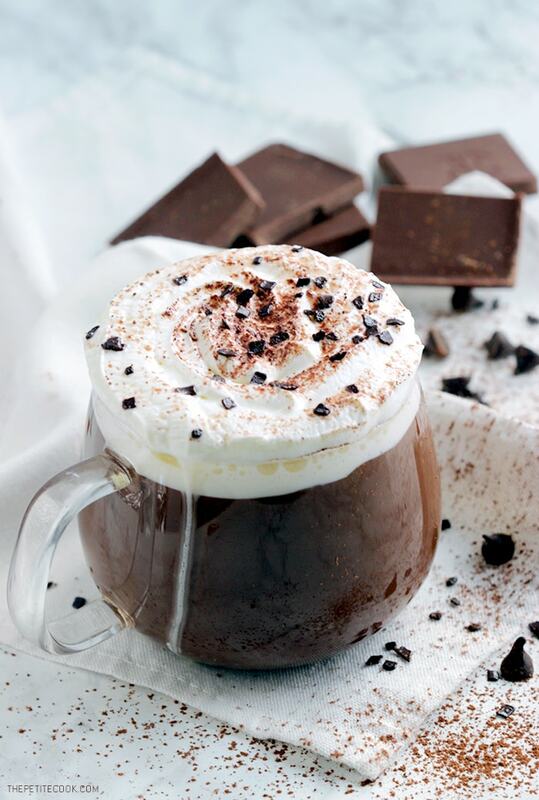 Italian hot chocolate is a rich luxurious treat that takes only 5 minutes to make. Half-way between a drink and a dessert, this is probably the BEST hot chocolate in the world! 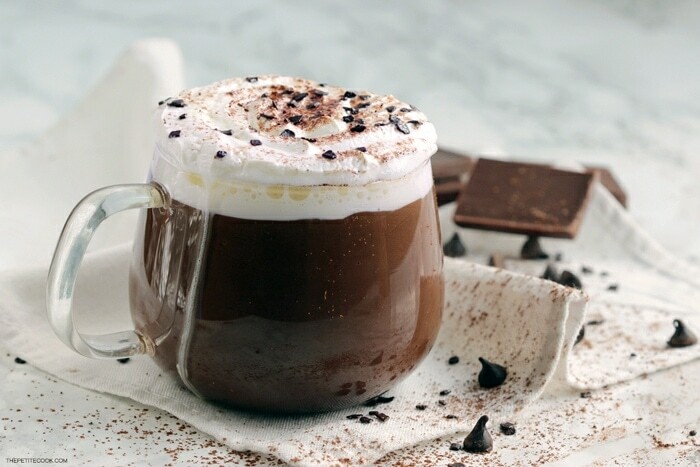 Smooth, uber rich and so indulgent, Italian hot chocolate is hands down the best hot chocolate in the world. It has nothing to do with the watery, sad version often served at bars and cafeterias around the world. I’ve tasted (and tested) hot chocolate in Japan, France, Germany, UK and a bunch of other places, but not once I was handed over something nearly as close as the decadent Italian version. On the other hand, the most amazing hot chocolate I’ve ever had is served at Caffè Rivoire, right in front of the famous Piazza della Signoria in Florence, Italy. If you happen to be in the neighborhood, make sure not to miss it. 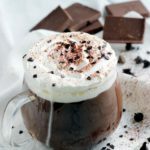 Cornflour is the secret ingredient that makes this hot chocolate so decadent and rich, but goes completely undetectable over your palate. To bring out the amazing chocolate aroma use the best dark chocolate you can find. It does make a HUGE difference. Some o my favorite chocolate brands include Pascha Chocolate and Alter Eco. But there are lots of good brands out there, just remember that good chocolate should be made only with cocoa mass, cocoa butter and sugar (some add vanilla too). Add a splash of pure vanilla extract, a drop of your favorite liquor (Baileys, Rum, Grand Marnier are my favorites! ), or spice it up a little with a pinch of cinnamon. Top it up with whipped cream, extra cocoa powder, mini marshmallows, a drizzle of salted caramel sauce or dulce de leche, crushed toasted hazelnuts, or anything else you may dream of. Deliciously warm and thick, Italian hot chocolate is the ultimate luxurious treat to satisfy your chocolate cravings! 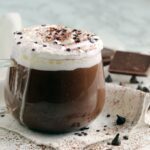 Italian hot chocolate is rich, creamy and decadent. Half-way between a drink and a dessert, it's the most delicious way to warm yourself up this winter. Pour the warm milk in a large pot. Whisk in the sifted cornflour, cocoa and sugar. 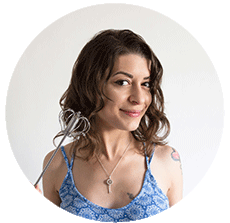 Warm the mixture over medium-low heat, whisking occasionally to avoid lumps. Bring the hot chocolate mixture almost to a light boil, then reduce the heat to low and fold in the chopped dark chocolate. Whisk the hot chocolate until creamy and dense, adding more sugar if you like it sweeter. 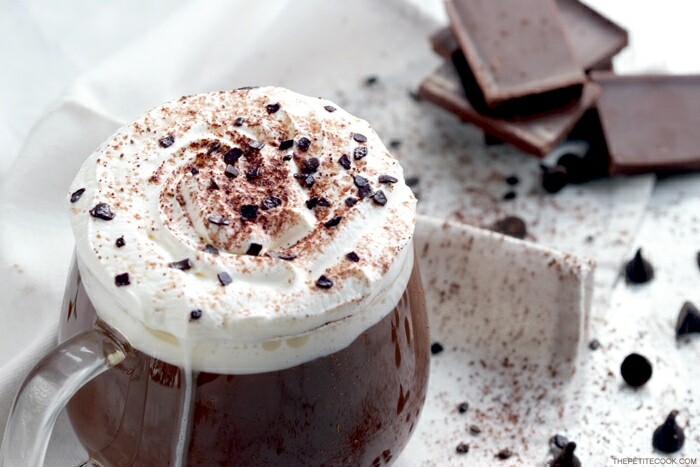 Divide the Italian hot chocolate among two cups, top with whipped cream and serve. Post originally published in December 2015 and updated with more info. 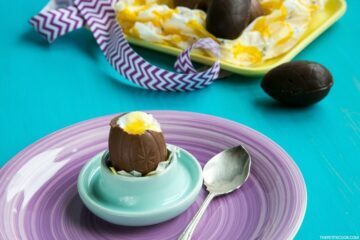 I make this recipe for my nieces every weekend, they love it! The perfect comforting drink for cold weather! My daughter LOVES hot chocolate and this looks like one she -and I- would really enjoy! That looks like the perfect hot chocolate. I can’t wait for the cold weather to enjoy some of this. 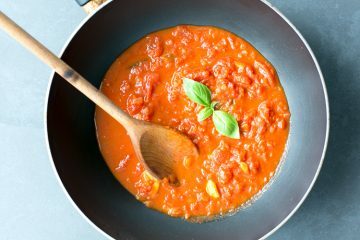 Cornstarch is a clever way to thicken this up! I bet it makes it even more indulgent! This looks crazy delicious! I am a chocolate LOVER! that is it! I am gonna have to make! This looks almost TOO good! I was just in Ticino in the South of Switzerland and had one of these. It is to die for. I will definitely be trying out your homemade version! OMG! I could never resist an Italian hot chocolate. I grew up with it and whenever I go to Italy I must have it, at least during the winter months (usually it is replaced by ice cream during the summer). 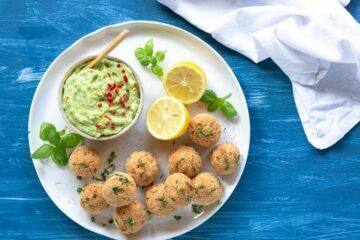 You recipe and photos are fantastic! If you make it dry, in a jar, for a gift. What is the milk to powder ratio?! I’ve never had Italian Hot Chocolate before. This looks so delicious! I’d like to make it for our Christmas party, spiked with some Baileys. Gorgeous photos as well. AH!Baileys! Haven’t thought of it before, I’ll make sure to add some of my homemade baileys next time, thanks for the GREAT idea *_*! And you NEED to try this chocolate, it’s absolutely irresistible!